Worth a try - of course there's not enough P.I.S.S. to satisfy demand. 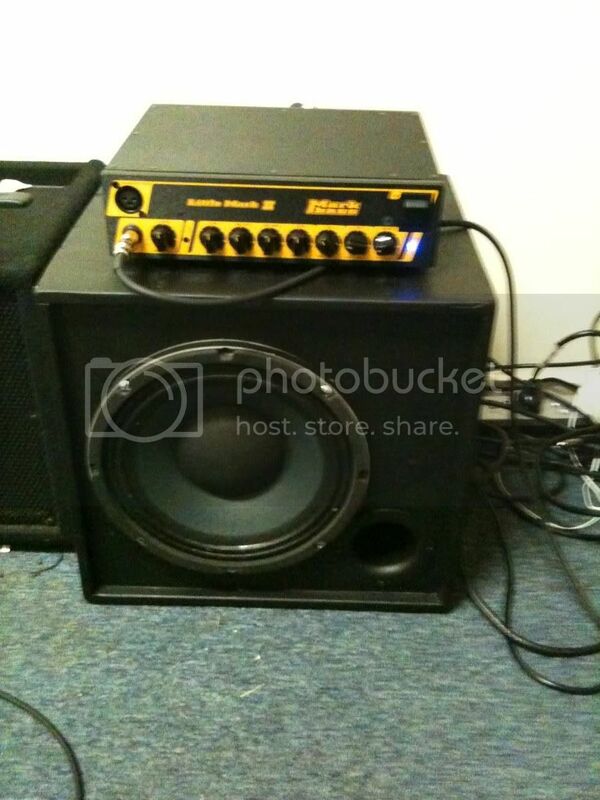 Now that I'm a poor bank-owned home-occupier I'll have to try building my own cabs. Want a cab for practice and small gigs so I might try some of those cheap drivers on e**y and see how my new router bit goes. This thread has truly been inspirational! Which drivers? Do the math before buying them.. or get me to do it. Cheap is good, but not if the end result isn't usable. Sounds awesome although i still haven't quite finished yet ( will be carpeted tomorrow and need smaller headed bolts for the speaker), had to plug it in and give it a go and suss out if the port needed any more length taken off. (which it does). "The music business is a cruel and shallow money trench, a long plastic hallway where thieves and pimps run free and good men die like dogs. There is also a negative side". Justin that looks great so far. That one's getting a tweeter isn't it? You may have jumped the gun in assembling it as you're now going to have a hard time cutting a hole for the tweet. The recessed baffle is going to make it hard to manoeuvre the jigsaw. Don't forget to throw it onto a set of scales at some point too. i have some big drills that will cut the 43mm i need, very gently. this cab wasnt getting the tweet but is now. Wow that looks like a great combination. Still preliminary at this stage, I was thinking something along the lines of an 8" sub, 8" woofer and tweeter. Something along the lines of a mini Whappo Jr.
if you can find the right-sized hole saw, that would be the go for cutting for the tweet. 43mm = 1 11/16 inches. PilbaraBass wrote: if you can find the right-sized hole saw, that would be the go for cutting for the tweet. Yeah hole saw is what i meant. In summary, they're going great. As you know I initially I tried to make the fibreglass and wood cabs sound the same. Once I knew where I stood with that, I've made some changes and haven't even tried to keep the cabs in sync. Lately, I've been experimenting with tweeters/horns. Initially I put 2 of the same vifa tweet on the wood cab, kinda like what Accugroove do, and that made the wooden cab brighter and punchier, but the 2 ohm tweeter load made the 2 ohm crossover a little unstable. I was just about to change to series wiring for an 8 ohm load and had already made an 8 ohm crossover for it when I stumbled onto some information from a contact in the industry about which compressions horns are used by Epifani, and which are used by Bergantino in some of their cabs. I managed to snag 2 of the horns as used in the smaller Berg cabs, and installed one of them into the wood cab instead of the 2 vifa's. I even gave it a variable L-pad knob. It's a completely different vibe to the vifa tweet. The vifa tweet goes higher,right up into the 15K range. The horn doesn't go as high, but it's got more kick at 5k-6K which is where I like the snap when I'm slapping of playing with a pick. On stage it has the perception of sounding louder even though my measurements show my attenuation circuit has it a spot-on equal with the vifa tweet. I can only surmise that that really high 10K+ stuff gets a little lost in gig situations and the 5-6K compression horn cuts through better. Only problem is it added nearly 1kg of weight. So for that reason I didn't install it on the fibreglass cab because on that cab, weight is everything. So for now that both cabs have very different high-frequency drivers and therefore sound very different, and I'm using that to my advantage. I put the wood cab on top if I think the gig is going to be a slappy, snappy kinda vibe. If I feel the gig is going to need something a bit smoother and not as punchy, I put the fibreglass cab on top so the quieter (by perception), less intrusive vifa tweet is what gets heard. I also use the fibreglass cab as the "party speaker" because thanks to the vifa tweeter, it sounds better than the wood one with recorded music going through it. I'll probably put 2 vifa tweets on the fibreglass cab in future, wired in series for 8 ohms so I can add a variable L-pad knob. that way I cab crank it up at gigs and down when I'm playing recorded music through it. It's been a few months, and I'm pleased to report the Composite cab is holding up the the rigours of gigging just fine. It currently looks pretty much the same as it did when I built it. knowing some women, it's quite possible that the handbag weighed more. I finally have some time available and am getting ready to glue up the glass/foam panels I built in the spring. I was hoping to clarify one point regarding the info your boat building buddies gave you about joining the panels. Did they say that there was no need to add glass and epoxy to the joints as the fillet would make the joint strong enough by itself?